Honda's top of the range tiller/ rotary hoe is powered by a huge GX200 providing plenty of power to the 600mm tines in order to crush all soils. With the ability to till in both forward and reverse (2 gears forward and 1 reverse gear) and a added dead man clutch for user safety, a prime concern for Honda. Boasting Honda's innovative Active Rotary System, which is a patented coaxial counter-rotating tine drive mechanism significantly increasing the stability of the machine for smoother, easy operation. Honda's reputable 4-stroke engine technology is present all their outdoor power equipment and this Honda tiller is no different. The GX Honda range reliable and dependable with running low emissions, less noise than the competition and most notably it is very fuel efficient. 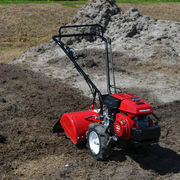 Honda also utilise a differential lock for tough soil or virgin soil, making jobs so much easier. Leading the world with 4-stroke engines removing the need of fuel mixing. 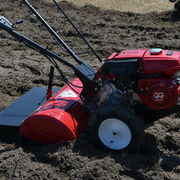 Also equipped with multiple features such as auto-decompression, electronic ignition and anti-flood primer system all working to guarantee your Honda tiller starts first timer, every time. 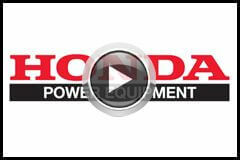 And as per usual your Honda equipment will come with a 4 year domestic warranty (1 year commercial) as Honda back's their products in for the long haul and so should you.